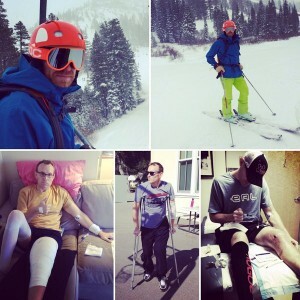 January 4th, 2013 my husband (Superman) was in a horrible ski accident and he emerged with only a broken right ankle and a totaled left knee. The worst part was after his surgery he developed an infection in his knee and became septic. This took our family through a nightmare I never thought would happen to us. My 38 year old Superman was down and sense of invincibility was brought back to reality. For nearly two years, our family was forced to be house-bound and re-evaluate our life. Suddenly, the hamster wheel of work and raising children in the never-ending grind of the California, Bay Area came to a screeching halt. Thankfully, my Superman has recovered through countless surgeries and hard work #noquit attitude. While painful, this experience opened our eyes to consider possibilities that we never would have, especially as a young family. Over the three years we opened ourselves up to think about what’s next? Once Superman was healthy enough for us to take a summer vacation, I declared I wanted to go somewhere and see something we’d never experienced before! Even though my world has been small (since college we’ve been raising two young girls and working), we’d stuck to the same beach vacations I always wanted and loved. Now, things were different…we were different. After everything we’d been through, there was a sense to do something. I began to research the Northern Rockies and envisioned us experiencing breath-taking views of a different kind. Then as fate usually goes, we needed a tipping point. We were out to dinner with our college friend from Texas who is a fly fishing guide in the summer. He and his family live in Idaho during the season and encouraged us to consider the Teton Valley as an option. The irony here is Superman was born and raised in Nampa, ID. (outside of Boise). He left for the Navy at age 18 and always prided himself on NEVER going back! The summer of 2014, our family of four packed up the car with our two dogs and drove from Menlo Park, CA to Driggs, Idaho. When we drove along the Snake River and gazed at the endless green fields (…remember CA has been in a drought! ), we knew we had made the right decision to take this kind of trip. However, it was love a first site as the view of the Tetons slowly revealed themselves as we drove into the Teton Valley for the first time. We rented a house for two weeks in neighboring Victor and something FELT different. We were a different family here. Yes, we were on vacation…but, there was an element of HOME.